The Alkadyne PE100 range features world-class pressure pipe resins that have been tailored to meet specific end use applications. HDF193B is Australia’s most trusted PE100 with a long track record of proven performance in water, gas, and mining industries. HDF145B has been designed for the extrusion of large bore, thick wall pipes and has enabled projects with pipes at over 110mm wall thickness. HDF193N is a high performance natural PE100 resin used as base resin for striping compounds and non-standard pipe products. 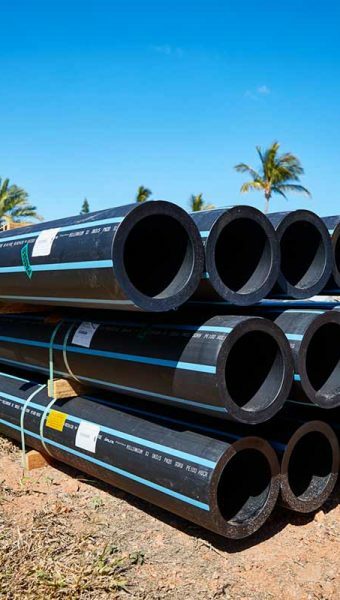 The latest addition to the Alkadyne range, HCR193B, is Australia’s first resin that meets and exceeds the PIPA specifications for high stress crack resistant PE100 HSCR, specifically engineered to withstand the harsh conditions pipes experience during trenchless installation proven now in a growing number of projects. Find out more about individual Alkadyne PE100 grades by clicking on the grade reference in the table or download product technical literature. Qenos also supplies specialty PE100 pipe grades featuring increased resistance to disinfectants (PE100 RD) or high application temperatures (PE100 RT). Contact us directly for more information. HDF193B 0.3 0.961 High Density black PE100 Type resin certified to AS/NZS 4131, for use in pressure pipes and fittings. Excellent low sag properties and throughput, suitable for the majority of PE100 pipe dimensions. HDF145B 0.2 0.961 High Density black PE100 Type resin certified to AS/NZS 4131, for use in pressure pipes and fittings. Exceptional low sag properties and throughput, suitable for the most challenging pipe dimensions. HDF193N 0.3 0.952 High Density natural resin designed for extrusion into a full range of non standards pipe products and as a base for PE100 Type striping and jacket compounds. HCR193B 0.2 0.959 High Density black PE100 type resin with high stress crack resistance (HSCR) certified to AS/NZS4131 and in accordance with PIPA guideline POP016, for use in pressure pipes and firings. Designed for trenchless installations and high abuse environments.